What Is an Out of Province Vehicle Inspection? Any motor vehicle that is coming from outside of Alberta must pass an Alberta Out of Province Vehicle Inspection (OOP inspection) before Alberta license plates can be issued to the owner and the car can be driven in the province. This inspection must be performed by a certified technician who is licensed by Alberta Transportation’s Vehicle Inspection Program. But when do you need this inspection? What does it involve? What happens if your vehicle fails? Read on to find out the answers to these questions and more! When Do I Need an Out of Province Vehicle Inspection? If you have moved to Alberta and brought a vehicle in from another province, then you will need to have an OOP inspection completed. This inspection must be completed within three months of the vehicle entering Alberta. An Out of Province Vehicle Inspection is a basic safety and mechanical assessment of a motor vehicle. There are a number of factors that a technician will look at to determine whether the vehicle is fit to pass or not. The technician is simply making sure your vehicle is safe and ready to handle Alberta’s harsh climate. During this part of the inspection, the technician will inspect all vehicle components, including fuel and exhaust systems, electrical systems, engine controls, steering, suspension, wiring, etc. to ensure proper functioning. Note: The vehicle must be maintained within Original Equipment Manufacturers (OEM) standards in order to pass inspection. This part of the inspection establishes whether or not the vehicle’s frame or body exhibit any signs of major damage or repairs. The technician will also examine the vehicle for body or frame corrosion. The inspection generally around takes two hours to perform. Did you know? Park Muffler doesn’t require you to book an appointment for your OOP inspection (or any work for that matter). So stop by and drop off your vehicle on your schedule! What If My Vehicle Fails? 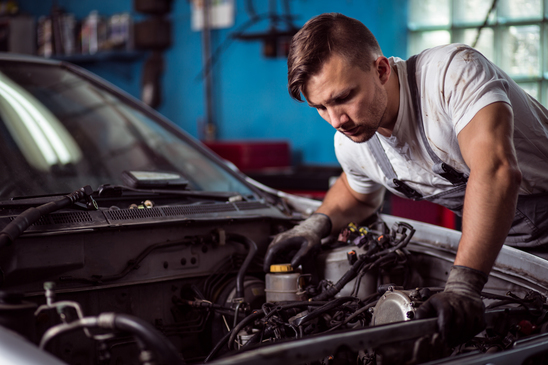 If your vehicle fails the OOP inspection, you are required to have it repaired within 10 days of the initial failure notice to avoid any additional fees. Vehicles repaired and submitted for re-inspection within the 10 days will only have to have the previous noted repairs inspected. When your vehicle passes the inspection, you’ll be given a certificate. This inspection certificate is valid for 14 days and the vehicle must be registered in Alberta within that 14-day time frame. If your inspection certificate expires before you register your vehicle, you will have to go through the full inspection process again. Bring your vehicle into Park Muffler for a comprehensive, unbiased assessment of your vehicle. Our certified technicians will make sure your vehicle is roadworthy and ready to drive as an Alberta registered vehicle. Drop by today for your Out of Province Inspection today!